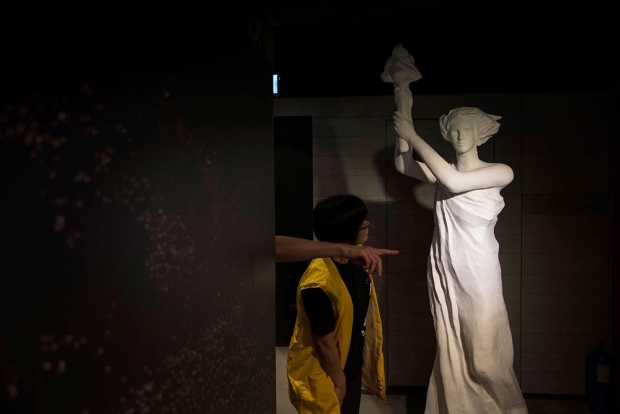 On April 26, 2014, staff prepare for opening day at the June 4th Museum in Hong Kong—the world’s first dedicated to the Tiananmen Square massacre of June 4, 1989. Some believe that China’s economic growth and rise to international prominence have lent the Chinese Communist Party a new legitimacy. But the people of Beijing understand better than anyone else how fragile this legitimacy truly is. The Party’s rule is unsustainable—as the continued abuses perpetrated under the “Chinese model” make all too clear—and has no stable moral foundation. Violence, fear, and lies are the very essence of Communist Party rule. So every year, before and after the day of the massacre, the regime lays bare its own fear and reveals the absurdity of its position. Public assembly is forbidden; intellectuals are arrested if they gather in private; tourists strolling across Tiananmen Square flashing V signs are pulled aside and interrogated. The effect, ironically, is to remind us all how important the massacre remains, even today. Many people lament that the Party’s system of censorship and brainwashing has turned China into a society that forgets and evades the past. In some ways this is true. But think of other countries’ examples. In the late eighties, the loosening of state controls on expression in the Soviet Union unleashed a flood of media exposures revealing the abuses committed during the Stalin years. Though Stalin had been dead for more than three decades, long-suppressed memories rose to the surface, and the outcry against Stalin’s tyranny became an important force in bringing about the end Soviet rule. At the same time, in Taiwan, memories of the 2-28 Massacre 40 years earlier created an upswell of public feeling that challenged the Kuomintang’s monopoly on power. Tiananmen is the regime’s Achilles heel, and it represents an important starting point for change. Its significance for the future of China will only become more evident with time. Xu is absolutely right, about more than one thing. First Tiananmen is the regime’s Achilles Heel. Remember the myth: Achilles, the regime, actually died when a poisoned arrow was lodged in his heel. It is not a blemish or a blip that can be made to lessen or disappear simply by the passage of time or by other countervailing achievements. It tells us that some defects prove fatal; just so the fact and the long denial of the Tiananmen massacre, which is like an unexcised cancer, one of many with which post 1950 history is littered, that can bring the regime down. It is most realistic to imagine this happening at a time of renewed political tension and competition in the elite, something for which we have many precedents, when it becomes to someone’s interest to re-open the issue as part of a larger process. Khrushchev, after all, served Russia’s interest as well as his own when he delivered his “secret speech” revealing the truth about Stalin in 1956, only three years after his death. Some Chinese commentators believe, however, that denunciation set the Soviet regime on the course that brought it to an end thirty five years later and imagine that if only lying about Stalin could have continued all would have been well. Not so: like the crimes of Stalin, the crimes of the CCP at Tiananmen and other times will not gradually disappear with time: they will remain potentially fatal until acknowledged entirely and paid for. As Aleksandr Solzhenitsyn stressed, however, a regime cannot survive that through constant lying. This is particularly true when educational levels rise dramatically, as they did in the USSR from 1953 to 1991, and have been doing in China, most notably since 1977. An educated population requires new institutions. China will change, I believe, and Tiananmen once again become pivotal, at a time of general truth telling—the necessary prerequisite to genuine development, cohesion, legitimacy, and strength for whatever follows the CCP. Consider what reactions will be as truth about the past becomes known and drawn into political play: no less than a shaking of the foundation of all the lies upon which the present order rests uneasily. Second. Xu points to the numerous examples, in Asia and one could add the rest of the world, where a massive truth telling has ushered in a new, legitimate, and stable regime. Taiwan is perhaps the most relevant example but Spain is applicable too, as well as the former states of the USSR—and even, to an extent, Russia herself, where culture is restored, property is widely and freely held, and the myths of the Soviet period lie in ruins, believed by no one. As we all know, though, although the cancer has been excised in Russia, rule today is not really even a regime of institutions and laws—rather it is a kind of dangerous mafia-style administration that may bring new disasters to the country. This is because the door to reform was opened, but not all the political elite passed through. Even so, Putin has no heir. He has no shelf of ideological writings. His Russia party consists entirely of opportunists and will dissolve as soon as he disappears. There will be no Putinism after Putin. Rather, another opportunity for true change may open up, and may be fumbled again. This is why, Franco in his later years, the murderer of untold numbers of Spaniards, planned for a future that would be different—bringing back the king, providing for liberalization etc. These plans were disordered a bit with the killing of Carrero Blanco in 1973—and after Franco’s death in 1975 (He was an exact contemporary of Mao but one year older) Spain became fully free. The CCP should be planning such a transition too, one in which its own power gradually becomes no less and no more than any other party’s. Otherwise conflict threatens. But as Xu points out, genuine change is possible. It is available as an option that can be chosen if only the choice is made to do so. No metaphysical obstacles exist to it. In fact it would be immensely popular in China and bring glory to whoever managed it. Chiang Ching-kuo was a murderous secret policeman at the start, though tempered in ways still unclear during his period as a student and as a hostage in the USSR. Taiwan today has moved far beyond where he took it—the abolition of martial law and the refusal to follow American plans that he settle with China. The verdict of history is already positive. Chiang, I believe, grew and learned, and was affected by the moral orientation provided by his genuine Christianity. No Chinese leader today has a comparably complex background. Had Deng taken the opportunity of Tiananmen to reform, he would be remembered as a sage. Instead, notwithstanding his partial dismantling of communist economics, I believe he will receive a negative historical verdict. In the end, what he did, whether massacre or economic reform, did not really lead to a viable future. The scene is surreal. While reflections on the Tiananmen bloodshed are pouring out from around the world, all related words and websites on June 4th have been shut out inside China. Control of online and social media is blazing through China’s Internet at frenzied speed. But do Chinese leaders truly believe that they can stop the worldwide buzz about June 4th and stop their people from knowing? Or are they digging their heads in the sand, pretending not to see and to hear? Over the past decade, a virtual square of multiple conversations and dialogues has been taking shape on the Internet, making it increasingly difficult for authorities to control information flow. With more than 600 million Chinese people going online and the proliferation of mobile devices, how much longer can the government suppress what people cannot forget? A quarter of a century after Tiananmen Square, China’s leaders are at another crossroads. For Xi Jinping to realize the “China dream” he is promulgating, the Party needs to close the wounds of Tiananmen and stop the bleeding. In Hong Kong, June 4th this year is taking on special significance as the 25th anniversary falls amidst rising tension between activists pushing for greater democracy and Beijing’s determination to control. For the generation in Hong Kong who grew up after 1989, the Tiananmen bloodshed has become all they associate with China, not how the Chinese Communist Party has lifted millions from poverty, or how China has become the second largest economy in the world. Over the years, the ranks of young people have swelled among the crowd attending the annual June 4th vigil in Victoria Park. Yet for the current generation in China, Tiananmen doesn’t exist or has no relevance to their present or future. Such a contrast is symbolic of the increasing disconnect between Hong Kong and the mainland, and the rising tension and polarization. For Hong Kong and the mainland, their sense of what constitutes China’s past and present is drifting apart. This does not have to be the case. Chinese leaders can gain good will and bolster its own legitimacy by taking on the legacy of Tiananmen. It can answer the calls of “reversing the verdict” by opening its archives, conducting fact-findings, and righting the wrongs. Many countries have shown ways to come to terms with their shameful past: the Holocaust, American slavery, Apartheid, and imperial aggressions that killed millions. Nations, large and small, have to confront their history, each in their own way that will put the country on a true path of harmonious development. Dai Qing, a writer who served nine months of jail time in the aftermath of the bloodshed, has proposed to set up a Truth and Reconciliation Commission after the South African model. Some say that the Chinese government is unlikely to act as long as leaders from the era are alive. That would be unfortunate, since it is precisely the duty of these leaders to fulfill their historical duty to bring closure to a tragic chapter of China’s history.